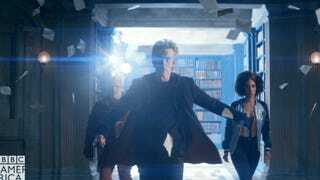 Doctor Who Across the Pond - Spoilerific Reaction and Discussion Thread for Series 10, Episode 1: "The Pilot"
“Nothing’s sad ‘til it’s over. Then everything is.” Please discuss! It is just 15 minutes away from starting on the East Coast of the USA, and I’ll be watching it with family. After the pilot “The Pilot” of the new series, I’ll jump back in to discuss and give my impressions. Also: spoilers.